This is a recent but MUCH LIKED new listing . Airbnb "SUPER HOST" & rated "EXCEPTIONAL" by Booking website. My Objective : "I truly want you to just feel at home" which is not hard if I do consider you not as an honored guest BUT as family. A proper, TWO room independent suite in the real sense. It consists of ONE large bedroom, an attached spacious closet, full bath, kitchenette with complimentary stocked refrigerator plus a SECOND but larger well furnished living room with comfortable leather loveseats, TV and window side eating. The accommodations listed are in a clean, beautiful large house that offers warmth and comforts of a home at reasonable charges. A place where hospitality is culturally inherent and a guest is embraced as family. You would be under a safe roof and in good hands. For any additional guest(s) OR an extended stay, please contact the host. Move-in directions : Provided upon booking. The suite is self contained but if need be, upon request, they can have access to our large full service kitchen and laundry room. It is suggested that you DO advise in advance if you have any allergies to dairy, nuts or any common cleaning ingredients. NO CATS for medical reasons. DOGS allowed with prior agreement. I was fortunate to be born into the proud and martial Sikh heritage from the Punjab, north India, known for their genuine warmth and hospitality. From the moment a guest enters into the shade of my roof, the inherent but unmistakable honor bound obligation of the host of my forefathers, carried down in my DNA kicks in. As if baptized at a divine alter, the guest becomes family from which point on, it gives me great pleasure and satisfaction to provide all possible safe comfort and warmth to the new member of the household. Go figure !! Product of Cambridge and N. American schools, hold a US & Indian dual citizen and am a business resident of Dubai. Well travelled , I have come to realize what a guest under my roof would need and expect for a comfortable stay. While located in a clean, suburban setting and sorrounded by woods and ponds that provide a semi country ambience to the sprawling lawns, you will be a few minutes drive away from all facilities like shopping including Briarwood mall and restaurants that one expects to see in any American city. Literally minutes to major highways historic and the famous University of Michigan campus that has made Ann Arbor the "Most Educated City In America" having elbowed Cambridge MA with its iconic Harvard University to the second place for two years running. toilet, shower, Full bathroom with toilet, sink and glass enclosed shower. toilet, combination tub/shower, tub, shower, An adjoining second full bath with twin sinks & tub/shower. A full bathroom with extra clean glass shower has a strong HOT and COLD water pressure at all times to provide our guests the luxury of long showers. Land line cordless phone is provided if upon request. Two 3 Ton AC units provide efficient central air. You will never be without air as even one unit fails for any reason, the second one suffices to take on the extra load. Twin high effeciency furnances keep the house at comfortable and desired temperature. Yes. More than ample fresh clean sheets and bedding items are stocked in the large closet in the room. Extra in the closet outside the room , located in the foyer. Access to the laundry room with newer electric Washing Machine is available upon advance request and no charge. Access to the laundry room with newer gas dryer is available upon advance advance request and no charge. Anyone renting the suite for 10 days or more, would be allotted a parking spot for one car in our multi car garage having remote control doors. Absolutely. Fresh towels for daily use stocked in the bathroom and your closet(s). Independent, furnished living room is attached to the bedroom . In main full service kitchen which you can use upon request. included with the kitchenette , conveniently located between the bedroom and the living room. Though a complimentary platter with coffee, tea and /or hot water is delivered to your door in the morning, a coffee pot [small] is available for in-room use. An ALL STEEL, in-suite kitchenette is equipped with two burner flat glass top stove, a stainless sink and a refrigerator plus a storage cabinet. In room . Table for two by the window is provided see photo For more, you are welcome to use extra dining in our large kitchen downstairs. Canoeing and Kayaking are popular summer time water sports on the local Huron river. Can be arranged against advance request. Upon request, access to the 50 x 18 extra large deck is provided. subject to conditions. On 2nd floor. Easy access by extra wide 15 steps , arched staircase with wooden railings [photos] at front door. The second large bathroom has a tub for hot baths. Twin large hot water heaters sustain a constant supply of hot water . The owner is resourceful and shall try to make your stay as comfortable and enjoyable as he possibly can. For additional guest(s) OR a longer stay, please contact host. Some personal services including a car, chauffer, massage and private chef are available upon advance request and subject to ADDITIONAL CHARGES. David Singh is an amazing host. Very friendly and courteous, my wife and I felt right at home. I highly recommend his place on your next visit to Ann Arbor. David is an exceptional host that catered to our every need. His home is amazing! We stayed in the King suite and enjoyed privacy, a heated spa tub, and a fabulous breakfast. The location is perfect. My son attends U of M and his apartment was only a 15 minute drive. I will be booking with David for two more events in the fall. One of the most genuine and welcoming people I’ve ever come in contact with. Initially I rented a room at David's home for 20 days for work at U of M. David and I spoke a few days before I was scheduled to arrive. During our conversation I mentioned to him that I planned on coming up a day early to avoid an approaching storm since I was driving from Texas and was nervous of driving on icy roads. He informed me that there was a couple that was staying in the suite I booked and it would not be available until the scheduled arrival date, however, he gladly offered me the master suite. Upon my initial arrival I could tell that he was unlike anyone that I had ever met. His wisdom and kindness is unparalleled. I ended up having to increase the length of my stay with no issues from David. I have not only had an enjoyable stay, but made a friend that I will keep in contact with even when I’m not in Ann Arbor. I would recommend this house to anyone in need of a good night sleep, someone just passing through Ann Arbor or anybody looking for a full belly and great conversation. Thank you David. You made being away from my family a little more bearable and I can’t wait for you to meet them. Meanwhile, I wish you success and happiness in all your endeavors. An incredible unmatched alternative to an over-priced hotel on a big UMich game weekend. We really didn't know what to expect, as we are not frequent VRBO guests. To avoid being repetitive, I'll just say we echo in entirety the comments of the other reviewers who stayed before us. David and Arjun were among the most gracious, warm, respectful, and kind hosts you could ever ask or hope for... going far above and beyond, yet never imposing or even remotely over-bearing. Would absolutely stay here again! A different, yet lovely experience. This is not your typical VRBO experience....in only good ways. It is much more like a bed and breakfast. Your host is a genuinely kind soul and opens his home and heart to his guests. 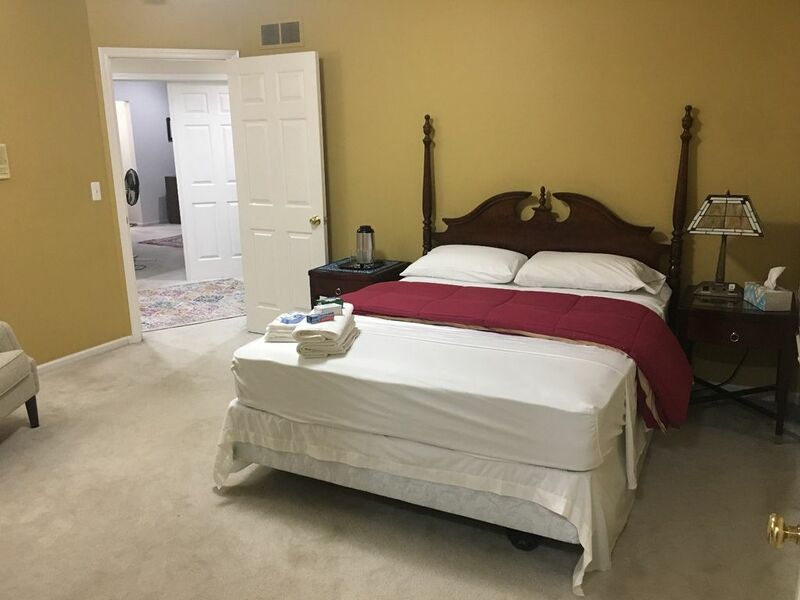 A tremendous value compared to hotel “ball game” weekend rates, and conveniently located to the University of Michigan campus (Approximately 5 miles) The deluxe queen suite offers ample room with a kitchenette and private TV room. However, you will probably find yourself gathered around the host’s kitchen table downstairs as he delights with stories of his life and world travels. Be prepared to make a new friend. I was fortunate that my nephew at the UM whom I had dashed to meet while in NY on a business meeting from London had made arrangements for my night’s stay at this place. I was lavished with hospitality. My short stay was pleasantly different than all my other experiences as a guest with hotels in Europe and the Middles East. I was lavished with genuine warm hospitality amidst tasteful comfort. David is a gracious host and a most interesting conversationalist of the “think tank” caliber. Wish I could have stayed longer. Ideally location: Literally minutes drive to Downtowns in Ann Arbor and Saline. Rather brief 15 minutes to central Dexter and 20 minutes to Chelsea !!! Located exactly on the land on which the late Mr. Avis of worldwide Avis Car rentals spent most of his adult life till his demise at 92, in 2007. Our location is God sent, where the benefits of urban America marry that of all a country location would have to offer. Serene , calm yet minutes from all modern services and downtown.